Where are the various colors used for inspection hgihlighting set? I see various code elements highlighed in this way, but cannot determine the patterm. Next looked at anything that seemed promising. Still no joy. 1. Find the Preferences setting? All editor colors can be found under "Preferences | Editor | Colors and Fonts" section. Where are the various colors used for inspection hgihlighting set? What color scheme do you use? If it's not Default or Darcula then switch to one of them and state what color is there. Without screenshot and actual code (which can be used locally) -- no idea -- your color scheme could be completely different to mine. I use the default theme. Here is a screen shot. Based on screenshot it should be "General | Warning"
Ok, so that is part of the question (ie, where is it set). So what is wrong with "return true". The help message talks about constructors, new and @return. I don't understand any of that. Sorry, cannot advise anything except trying "File | Invalidate Caches..." here after seeing one function out of context. I did "invalidate caches" and surprisingly, all those general error > warnings went away. 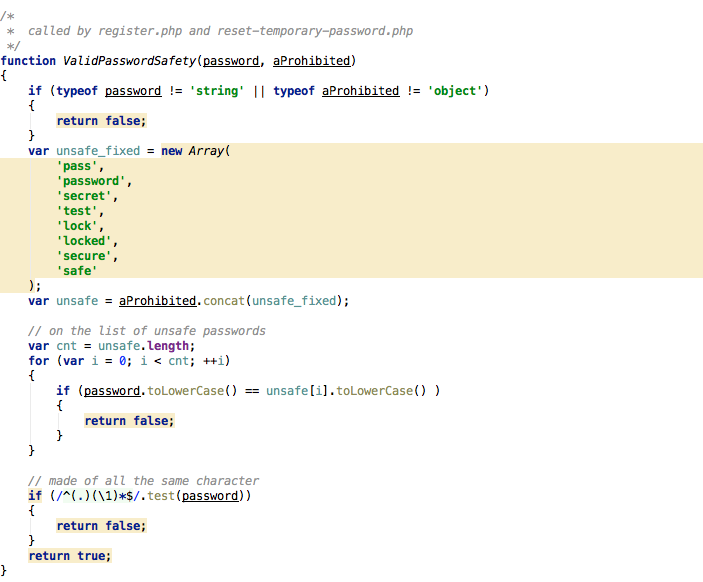 When I first started using PHPStorm, I did not even know what "invalidate caches" was because I never needed it. Seems it is a daily need nowadays. Seems it is a daily need nowadays. Not in my experience. Only after updating PhpStorm to a newer version (but since I'm on Windows .. and using full installer .. I can do this at uninstall/install step). But yes -- if you see an error out of nowhere that does not make much sense, especially if it was not there yesterday on the same code ... "Invalidate Caches" is the first thing to check. The VCS reporting "no changes" just after I have made a change.